During January, 2015 AudioNow® helped World Education Services survey college-educated immigrants across the U.S. as part of a new immigrant talent study funded by the Knight Foundation. Surveys were launched in five languages including Amharic, English, Haitian Creole, Punjabi and Swahili and asking respondents about their experiences living and working in the United States. Read the full Case Study, to learn more about this innovative survey technique. NEW YORK-Oct. 2, 2014-A new study of college-educated immigrants will track the experiences of underutilized, skilled immigrants in six cities to discover ways to better integrate and leverage the talents of workers who were educated abroad. The study is being led by the nonprofit World Education Services with support from the John S. and James L. Knight Foundation. The study will survey immigrants in four cities where Knight invests through its community and national initiatives program: Detroit, Miami, Philadelphia and San Jose, Calif. Boston and Seattle will also be included in the survey because of their large population of college-educated immigrants, and their potential to uncover valuable lessons for other cities. The U.S. is home to approximately 3.7 million college-educated immigrants who received their degrees abroad. However, 26 percent of these skilled workers are unemployed or working in low-wage jobs. This so called “brain waste” has negative consequences for immigrants and their families, as well as employers looking for high-skilled workers, and cities seeking to advance their economy. The first-of-its-kind study will track the career paths of workers who were educated abroad to determine the factors that lead to their success or limit their progress. Results will be used to create a set of recommendations for cities to better integrate skilled workers into their communities, and take advantage of their many talents. As part of IMPRINT (Immigrant Professional Integration), a coalition of organizations active in skilled immigrant integration, World Education Services will collaborate on this project with other IMPRINT members and community partners. In addition, the Institute for Immigration Research at George Mason University will serve as lead research partner. Finally, AudioNow, a technology company that helps radio stations reach immigrant listeners via mobile phone, will join the project as a research partner. The results of the study are expected to be released in early 2015. The Institute for Immigration Research is a joint venture between George Mason University and The Immigrant Learning Center, Inc. (ILC) of Massachusetts. Its mission is to refocus the immigration conversation among academics, policy-makers and the public, including the business community and media, by producing and disseminating unbiased and objective, interdisciplinary academic research related to immigrants and immigration to the United States. Did you know that IMPRINT is using a pioneering new technique to reach immigrant professionals for our survey? It’s true! 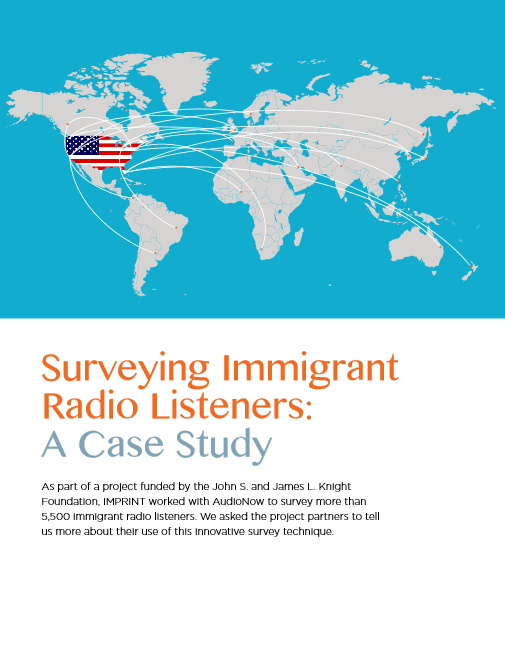 In addition to our online survey, we are partnering with the Washington, DC-based AudioNow to conduct a survey of immigrant radio listeners in five languages: Amharic, English, Haitian Creole, Punjabi and Swahili. Here’s the intriguing part: We don’t have to run ads to try to generate listener response. Rather, each listener is individually invited to participate in the survey when they begin listening to their favorite radio show. This works because listeners aren’t just passively tuning a radio. They are calling in to listen to the broadcast via their mobile phones. AudioNow is the leading provider of this “radio-by-phone” technology. It hosts broadcasts from more than 2,500 different radio stations, resulting in more than 2.5 billion listening minutes in 2014. Among its broadcast partners are the United Nations, the Voice of America, BBC, Haiti’s premier broadcaster Radio Television Caraibes, and Ethiopian Satellite Television. IMPRINT is delighted to be working with AudioNow to implement this new approach to data-gathering. Early signs are promising: AudioNow has previously used this tool in successful research on Haitian and Somalian listeners’ remittance practices. Learn more about AudioNow Research Services. Each survey has been pre-recorded by a radio station DJ, so that listeners hear a familiar voice. When listeners call in to listen to their radio station — such as Radio Television Caraibes — a short recorded prompt asks them if they are willing to participate in the survey. Listeners use the buttons on their phone to select an answer, such as 1 for Yes, 2 for No, and 3 for Maybe Next Time. Listeners who agree to take the survey will be prompted to answer approximately 12 short, multiple-choice questions. Listeners respond by selecting the button that corresponds to their answer, or pressing a different button to hear the question repeated. At the conclusion, listeners are invited to “opt-in” to receiving a call back to discuss their answers in more detail. This function allows us to gather some qualitative data to supplement the quantitative data produced by the automated survey. Once a listener has completed the survey (or if they have declined to take it), they will never hear the survey request again, unless they call into the radio station from a different phone number.